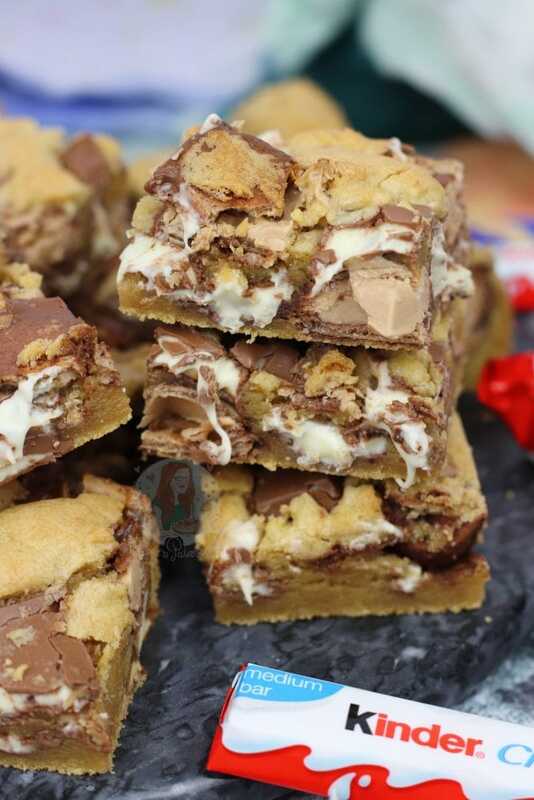 Gooey, Delicious Kinder Bueno Cookie Bars packed full with Kinder Chocolate and Kinder Bueno pieces! 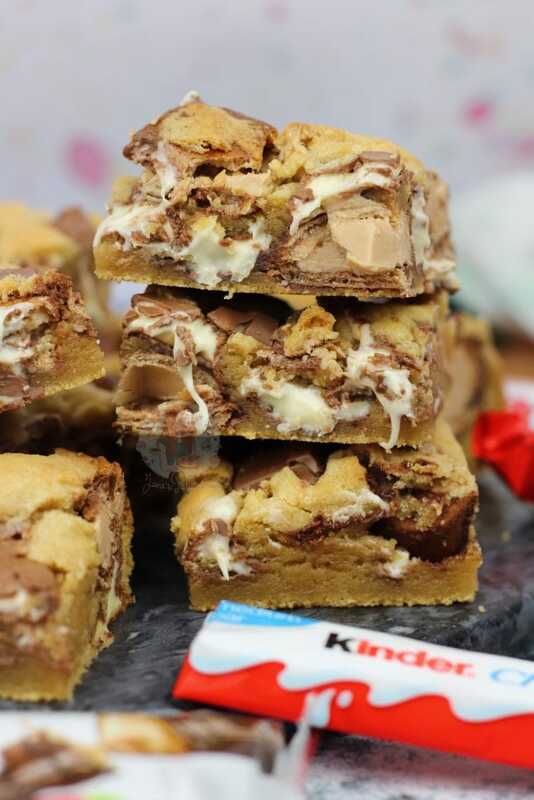 Kinder Bueno recipes honestly take over my blog a little. They’re always popular, and people always want more. 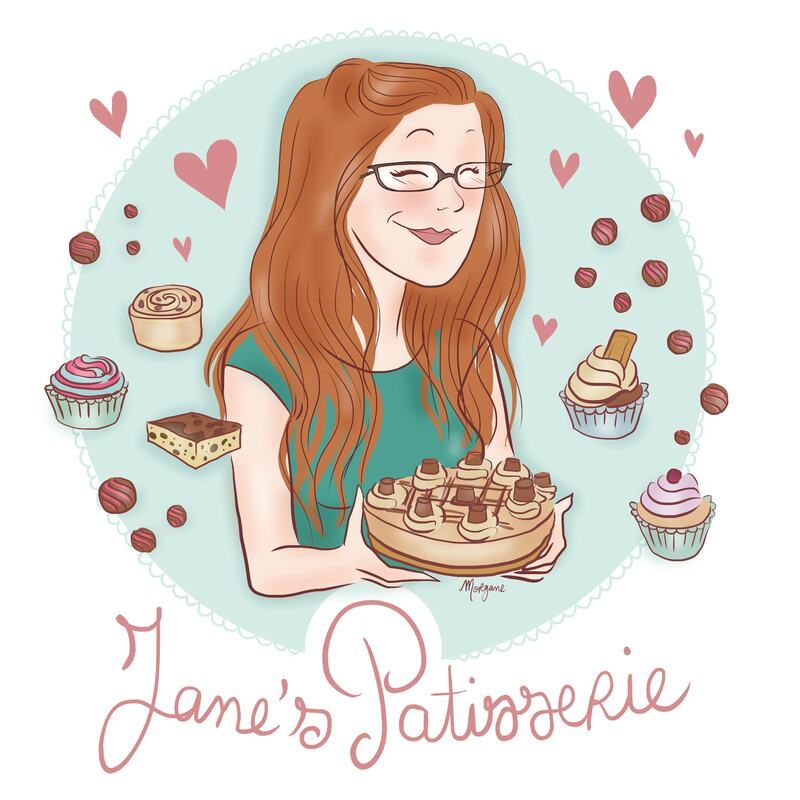 I’ve actually only got four Kinder Bueno related recipes on my blog so far, but they’re some of my most popular, especially my Kinder Bueno Cheesecake. 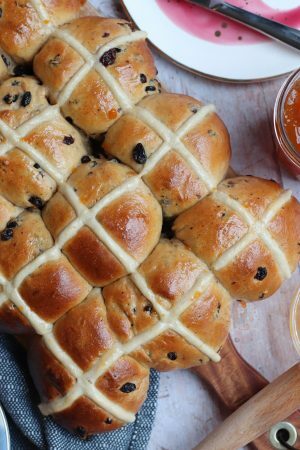 Not only is this always ranking in my top 10 of recipes every single day, it’s my most viewed video on my youtube channel, and is always a hit on social media. 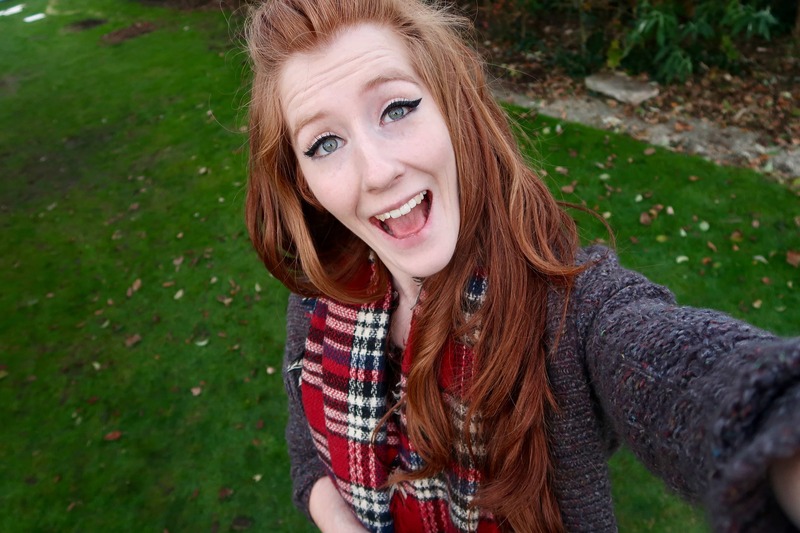 Because of how Kinder Bueno is an absolute kicker, I thought I should post another and I know you’ll love these. 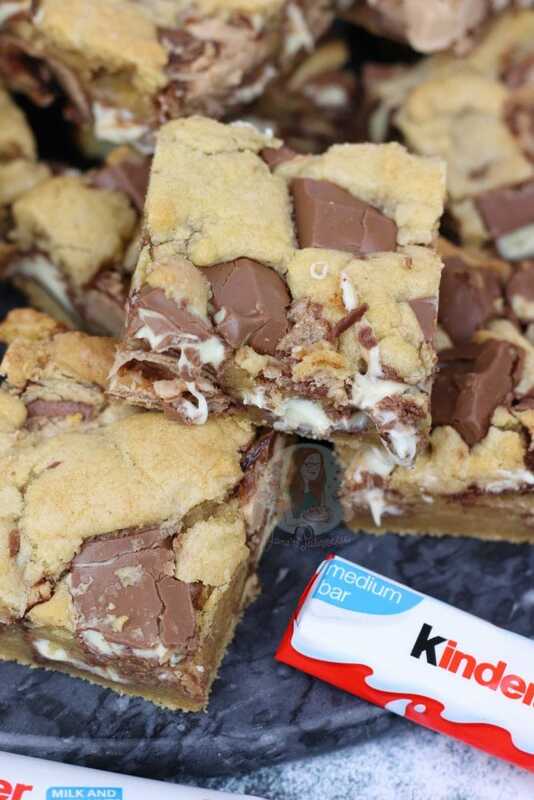 Cookie Bars are always a hit as well, but Kinder Bueno Cookie Bars?! Utterly next level. 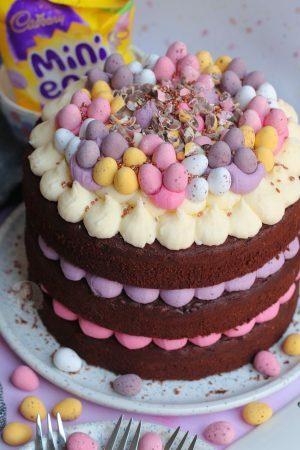 Packed full of Kinder Chocolate, and Kinder Bueno pieces, this is the sort of treat that people will ask for again and again without fail. 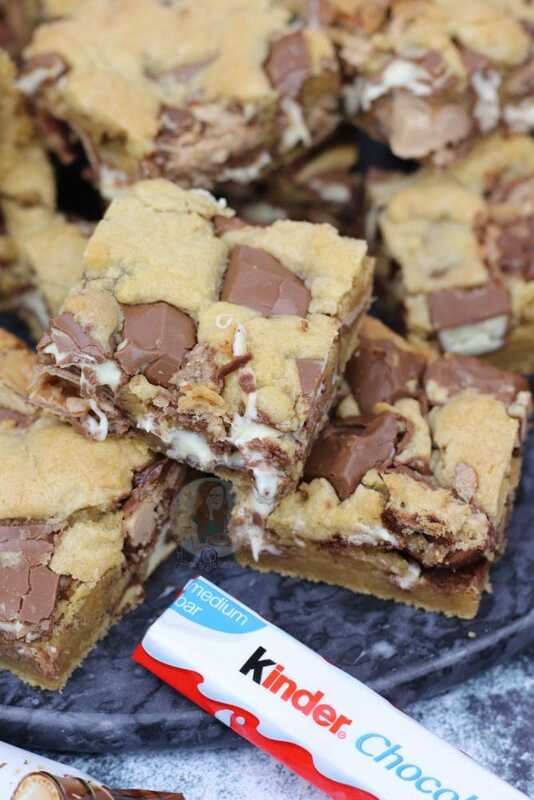 If you don’t like Kinder chocolate, however, please see my many other Cookie Bar recipes I have available! The only thing I often struggle with when making Kinder Bueno related goodies, particularly ones that involve the Kinder Chocolate itself, is that my Other Half tends to steal them as it’s his favourite chocolate. Honestly, he finds them and steals them, so I now have to hide them. They don’t stay in my usual chocolate box of goodies for him to raid, they’re upstairs in the office to avoid his temptation. When I suggested these bad boys to him, and he then told all his colleagues they basically jumped and screamed. However, I felt kinda mean that I didn’t share the first batch…. they were too tasty! However, I was kind and shared the next few batches I made as I was in a bit of a Kinder Overload for a while. I never thought there could be such a thing, but there 100% was. All I did was eat a different chocolate for a while, but I soon came back to Kinder. When I gave a different batch to some of my other Trusty Taste Testers, they said they were some of the best things they’d ever eaten. I did think maybe I had overdone some of the chocolate on the sides, but after baking these for exactly 19 minutes, and leaving them to cool for half an hour or so they were SO GOOEY and oh my actual days. Folding through the Kinder Chocolate is easy as its solid, but folding in the Kinder Bueno isn’t as easy because they’re quite a bit more fragile. If you’re worried, I did it a couple of times I did it where I put the Kinder Chocolate pieces in first into the cookie dough, and then the Bueno so it wasn’t quite as solid as just the dough on its own. It’s not the end of the world if they Kinder Bueno pieces break up, but if you do it by hand it’ll be a lot safer than using a mixer for this bit! If you wanted to make these into a chocolate cookie dough, rather than a ‘plain’ one, you can add in 25g of cocoa powder, but take out 50g of the plain flour. The cocoa powder dries the cookie dough out more in comparison to the flour, so you’d have a smidge less dry ingredients. If you wanted to make these into actual cookies, you’d have to add in 50g more flour, so that they don’t spread too much! 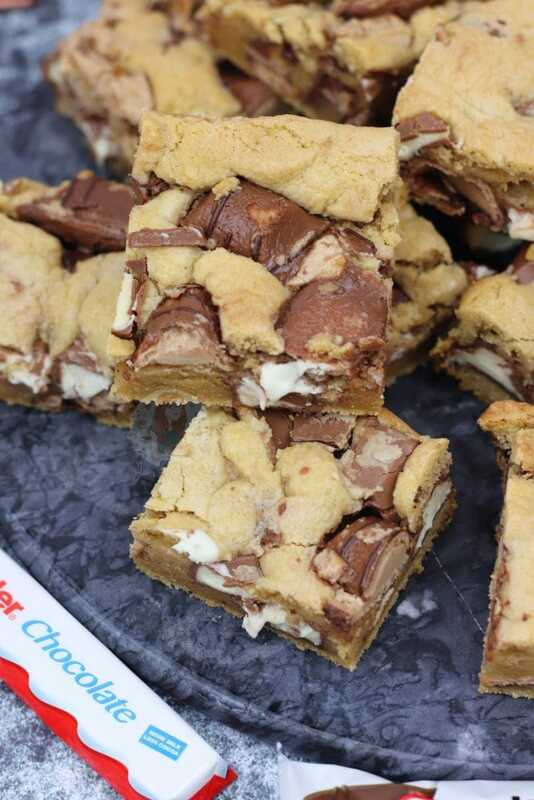 If you’re not careful, the chocoalte that is on top or sticks out of the Cookie Bars can burn slightly, but if your oven is the correct temperature it should be fine. If it burns really quickly, then something is wrong with your oven. 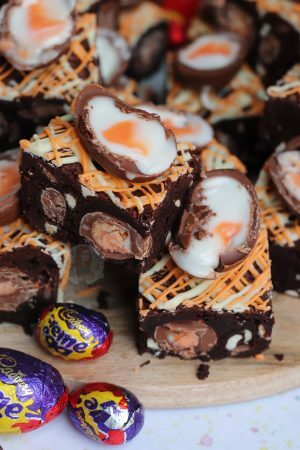 I bake these for 19 minutes in my oven, and the chocolate edges just ever so slightly start to boil a bit, and thats it. They’re never fully burnt because the traybake isn’t in for so long, and I use a fan oven at 170C. Preheat your oven to 190C/170C fan, and line a 9x9inch square tin with parchment paper, and leave to the side for now. Whisk together the Plain Flour, Bicarbonate of Soda, Salt and Cornflour together in a bowl and leave to the side for now. Melt the Unsalted Butter till liquid, and add to a bowl. Add in the Light Brown Sugar and Granulated Sugar and whisk the mixture together for two minutes by an electric whisk, 3 minutes by hand. Add in the Egg and Vanilla and whisk again till they're combined in. Add in the mixed together Dry Ingredients and mix until a really thick cookie dough is formed. 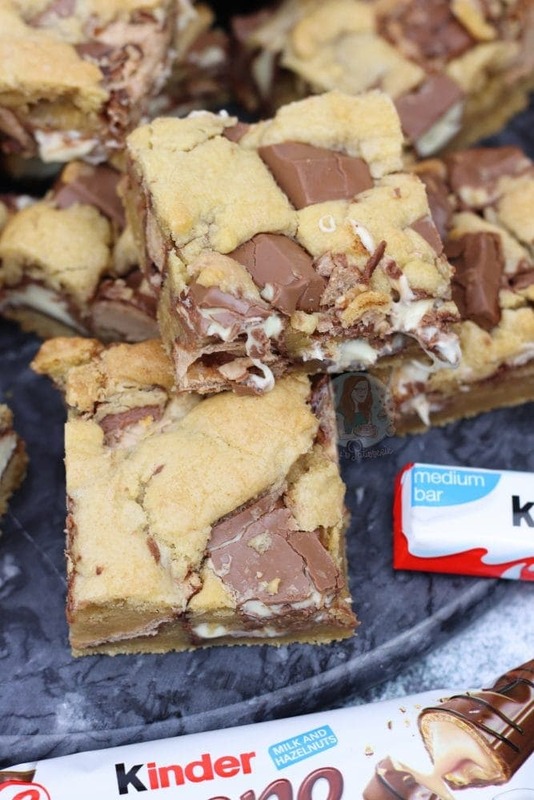 Add in the chopped Kinder Chocolate, and chopped Kinder Bueno, and fold through. 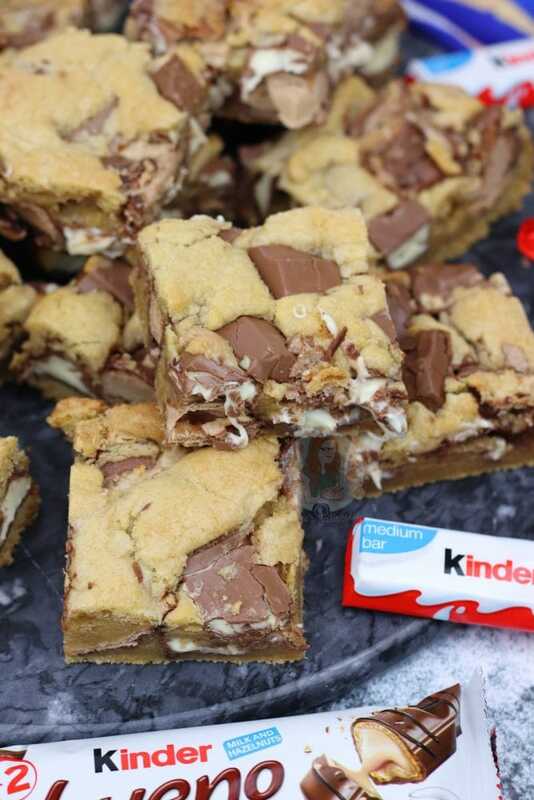 Reserve some of the Kinder Chocolate for the top of the Cookie Bars. 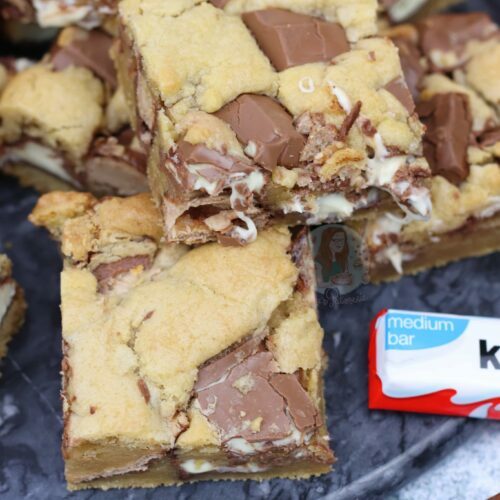 Push the mixture into the 9x9inch Tin, and add on the last few bits of Kinder Goodness. 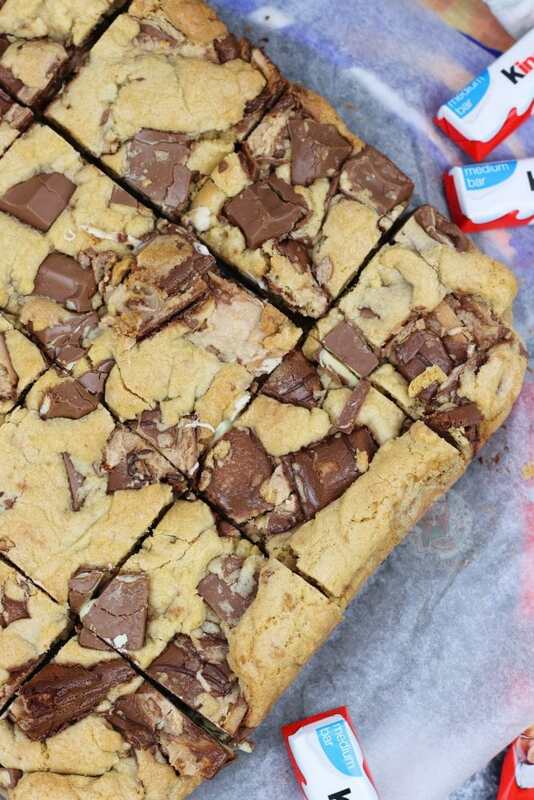 Bake the Cookie Bars in the oven for 17-22 minutes. I usually do 19 minutes so they stay reasonably gooey. Once baked, leave in the tin for 10 minutes to cool a bit, and then remove and cool fully on the wire rack. Enjoy! I bought two packs of the 6 Medium Kinder Chocolate bars, which weigh 126g per packet to make up the 250g for the Cookie Bars. Each multipack of Kinder Bueno is about 170-175g worth, so you can use one packet, or buy more and add a smidge more. Don't go too overboard though otherwise, it'll struggle to bake. You can use all Kinder Chocolate if you wish, but I wouldn't recommend all Kinder Bueno as the chocolate is what makes it gooey. No the wafers in the Bueno won't stay crunchy, but that's not the end of the world. it's there for the taste! These will last for 5 days or so after baking if they last that long. 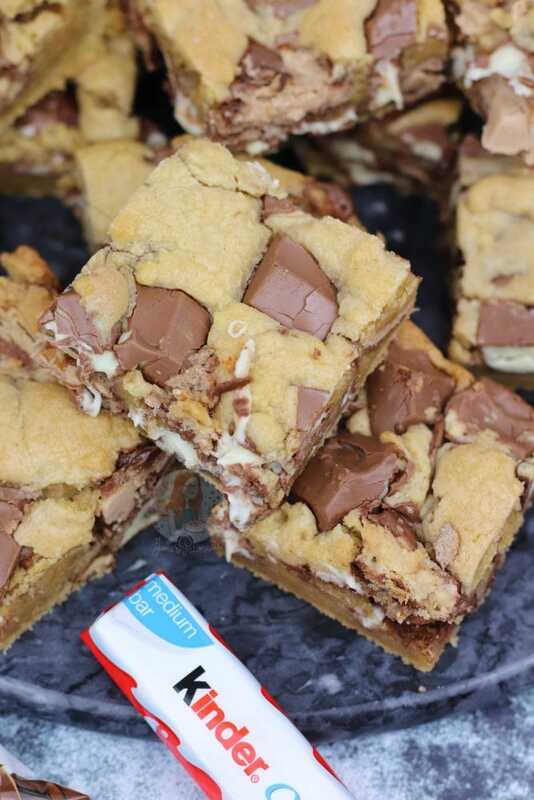 Feel free to rewarm in the microwave briefly for gooey bars! Older Next post: Butterscotch Cheesecake! Newer Previous post: Pumpkin Spice Latte Cake! These tasted amazing. Thank you for the recipe! Absolutely gorgeous, thank you for the recipe. We used just the chocolate bars (not the Bueno) and they came out lovely. The only downside is how quickly they get eaten! I was wondering when you say Vanilla do you mean vanilla extract?